Teeming with luxury and style, this gracious country estate features spacious rooms, volume ceilings, and four porches for extended outdoor living. Fireplaces in the living and family rooms grant warmth and character to these spacious gathering areas, while columns add definition to the open living and dining rooms. Built-in bookshelves in the living room are both attractive and functional, as is the built-in desk adjacent to the open, U-shaped staircase. 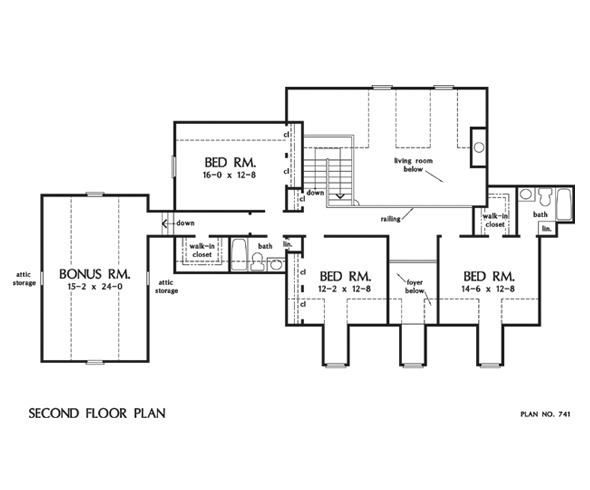 The master suite is more haven than bedroom with tray ceiling, sitting alcove, dual walk-ins, and luxurious bath. The upstairs balcony overlooks both foyer and living room while serving as an open, central hallway for the home's three family bedrooms and bonus room. 1st Floor: 2676 Sq. 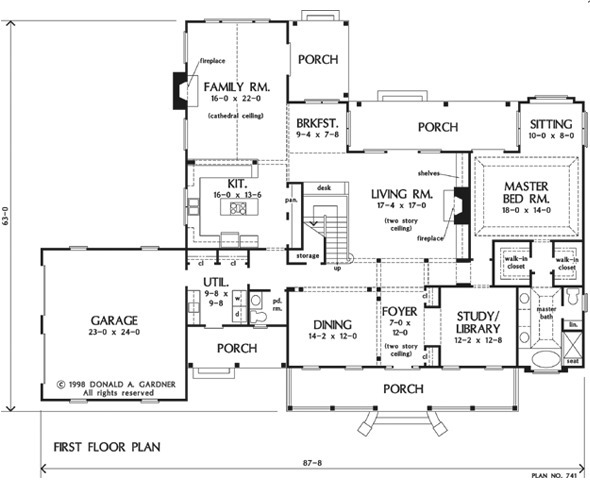 Ft.
2nd Floor: 1023 Sq. 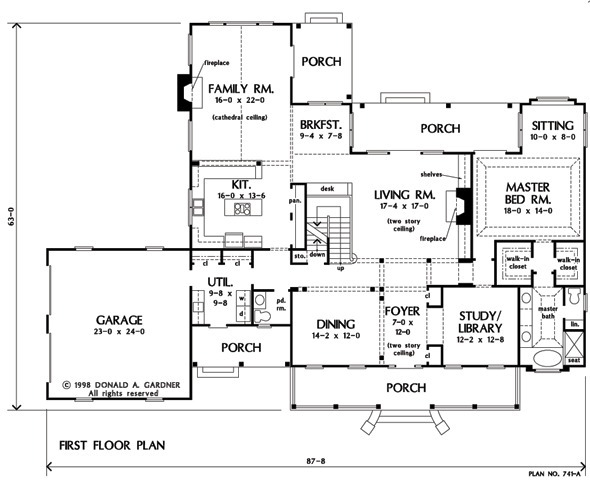 Ft.
House Dimensions: 87' 8" x 63' 0"
Great Room: 16' 0" x 22' 0"
Master Bedroom: 18' 0" x 14' 0"
Foyer (2 Story): 7' 0" x 12' 0" x 19' 1"
Dining Room : 14' 2" x 12' 0" x 9' 0"
Great Room (2 Story): 16' 0" x 22' 0" x 17' 6"
Kitchen : 16' 0" x 13' 6" x 9' 0"
Breakfast Room : 9' 4" x 8' 0" x 9' 0"
Utility Room : 9' 8" x 9' 8" x 9' 0"
Bonus Room (Vaulted): 15' 2" x 24' 0" x 9' 0"
Garage : 23' 0" x 24' 0" x 0' 0"
Bedroom #2 (Clipped): 16' 0" x 12' 8" x 9' 0"
Bedroom #3 (Clipped): 12' 2" x 12' 8" x 9' 0"
Bedroom #4 (Clipped): 14' 6" x 12' 8" x 9' 0"
Porch - Front : 37' 4" x 7' 0" x 0' 0"
Porch - Rear : 27' 4" x 8' 0" x 0' 0"
Porch - Left : 16' 0" x 6' 8" x 0' 0"
Porch - Right : 9' 8" x 13' 0" x 0' 0"
Media Room : 12' 2" x 12' 8" x 9' 0"
Living Room (Cathedral): 17' 4" x 17' 0" x 19' 1"
Balcony : 7' 0" x 8' 4" x 9' 0"
Storage (1st Fl.) (Sloped): 5' 8" x 2' 0" x 0' 0"
Other : 10' 0" x 8' 0" x 9' 0"
Master Bedroom (Tray): 18' 0" x 14' 0" x 10' 6"